Wheatgrass is fast becoming one of the most widely used supplemental health foods in North America. It contains chlorophyll (nature's most health promoting nutrient), 20 amino acids, several hundred different enzymes not found in other foods, as many as 90 out of 102 possible minerals, vitamins and other important nutrients. It is perfect for dieters, athletes, people on the go, who want to maintain a healthy immune system, or simply anyone who wants to look and feel GREAT and HEALTHY. Wheatgrass juice is possibly the closest thing to the fountain of youth as you may find. 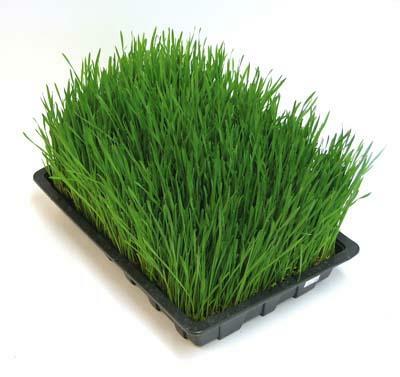 Considered a “Living Food”, Wheatgrass is a nutritional powerhouse. Just one, 1oz glass of freshly squeezed wheatgrass juice is equivalent to 2.2 pounds of fresh vegetables. Wheatgrass can be considered the "Liquid-Solar-Energy" of our Earth, providing a nutrient dense healing alternative and a path to self-healing through achieving a properly balanced body homeostasis. When used as a form of "medicine," the chlorophyll in wheatgrass and green juices, (plant blood) can immediately neutralize the toxicity levels in the body. Wheatgrass consumption through juicing, initiates the battle in eliminating heavy metals, toxins, and acid levels which are the direct cause of cancer and most "dis-ease" or "dis-harmony" within the cells of the human being.